PROVIDENCE, RI – Mayor Jorge O. Elorza today announced the City’s significant progress in its residential recycling program. 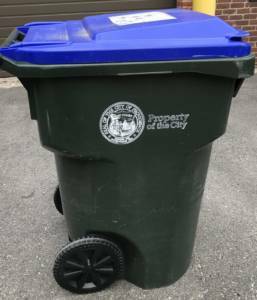 As of July 2018, Providence’s weekly curbside recycling rate stood at 14.6% of total waste collected, the highest seen since April 2013. The City has also reduced its contaminated monthly residential recycling loads by 50% since 2015, which means Providence is on track to meet its goal of zero contaminated recycling loads by 2030. While recycling rates have fluctuated over the years, residential recycling has steadily improved since June 2017. The City will build on this momentum through continued waste management education, awareness, and outreach campaigns. In 2016, the Office of Sustainability launched its SustainPVD Recycling Ambassadors pilot program, which conducted robust and targeted recycling education and outreach along a collection route in Washington Park. The program proved to be highly effective in raising awareness of proper recycling. After volunteer Ambassadors canvased the neighborhood, the Department of Public Work’s Environmental Division issued warnings every week to those households that had trash in their recycling carts. Over the course of four weeks, hundreds of warnings were issued, along with educational materials. After an extensive warning period, tickets were then issued to properties that failed to comply. Based on best practices from this pilot program, the City teamed up with its hauler, Waste Management, to scale this route-by-route solution using a combination of warnings, timely curbside feedback, and, as a last resort, ticketing. This approach prioritizes education and awareness building over penalization, using information as a tool to foster behavior change. Responsible and appropriate waste management goes far beyond recycling, and the Office of Sustainability continues to work on broader waste reduction messaging that encourages thoughtful action when it comes to consumption habits and single use culture.